An appeals court has upheld the acquittal of women’s human rights defender Azza Soliman and 16 others who witnessed the killing of Egyptian activist Shaimaa Al-Sabbagh. Read more. In the wake of the closing of the Titan and Pollyanna blogs, we are continuing the charity corner here. This week, the we refer you to Rabbis for Human Rights. The head of the organization Rabbi Arik Ascherman was nearly murdered by a settler last week while protecting the Palestinian olive harvest. Please read his description of the incident and make a generous donation to this worthy cause. This week we call on you to help the Nukak tribe of Colombia. Over half the members of the tribe have died since contact in the 1990's. They have been granted a reserve, but it is not respected by coca growers who supply the cocaine trade. Campaigning for the Nukak’s rights has already made a huge difference. 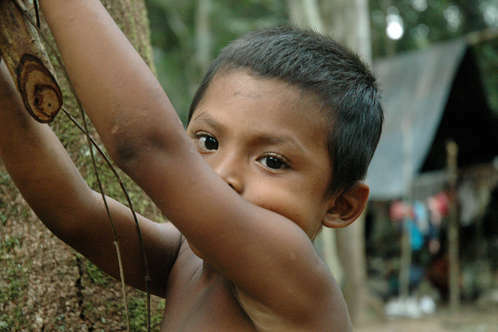 After campaigns led by Survival and local indigenous organisations, the Colombian government created a Nukak reserve in 1993 and enlarged it in 1997. What the Nukak want now is for the boundaries of their reserve to be respected and for them to be able to live there in peace.Please open the link and act on their behalf. This week we call your attention to child slavery. Please open this link and act on one or more of the cases provided. Estimates suggest a quarter of those in slavery are children. Among other abuses, these children are sexually exploited, forced to work, and even made to participate in armed conflict. All children deserve protection and the right to a childhood. Take action now to help end child slavery. The return to democracy in Myanmar appears to be a fraud. On Sunday 8th November the people of Burma go to the polls in what has been billed as a landmark election. Aung San Suu Kyi’s National League for Democracy is expected to win and so could form the next government. Does this mean democracy has finally come to Burma? Should we be celebrating? Sadly not. As you might expect with the Burmese military, all is not as it seems. Burma Campaign UK has published a detailed briefing paper with everything you need to know about the election. Here is an example of what we may expect to continue: After almost eight months in hiding, prominent student unionist Kyaw Ko Ko has been detained for his role in organizing student protests in Myanmar. He is a prisoner of conscience who must be immediately and unconditionally released. Please act. This is a second UA on Ali Aarrass, who is on hunger strike. Ali Aarrass was admitted to hospital on 27 October, two weeks after prison medical staff first recommended this. He is now back in Salé II prison, near Rabat, and is still in poor health. Please act.This may not be possible from Israel. On October 20, 2015, members of the Frente de Mujeres Defensoras de la Pachamama (FMDP, Coalition of Women Human Rights Defenders of Pachamama), an organization of rural women defending mother earth and human rights, along with Lina Solano, president of the Latin American Women’s Union (ULAM), were physically and verbally assaulted and arbitrarily detained by dozens of police and government security agents. Dalit folk singer and activist S Sivadas, popularly known by his stage name Kovan, was arrested on 30 October over two satirical songs which criticize the Tamil Nadu state government and chief minister. Kovan faces charges including sedition, provocation with intent to cause a riot and public mischief. If convicted, he could face a maximum sentence of life imprisonment. Please act and explain to the government in India that suppression of freedom of expression is not consistent with claiming to the be world's largest democracy.